When I registered for a writing workshop with Kathy Erskine in May 2014, I knew I was in for a wonderful writing experience. I had also been hoping to find other children’s writers who might want to form a critique group. Lucky for me, Marc Boston was also in the workshop! At one point, Kathy asked for volunteers to read aloud manuscripts. Marc volunteered. Based on the smiles and laughter in the room, I think it’s safe to say that everyone was delighted by his rhyming picture book manuscript. Well, Marc and I formed that critique group (along with other writers). He’s been cranking out the manuscripts and has been a great support to me on my own writing journey. And that picture book manuscript? 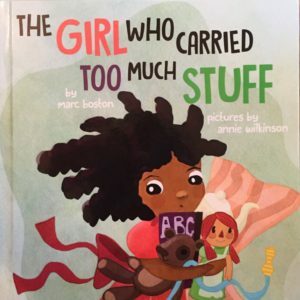 Marc ended up self-publishing it as The Girl Who Carried Too Much Stuff in October 2015. 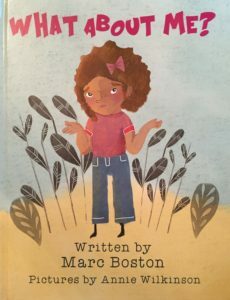 In June 2017 Marc self-published his second delightful picture book, What About Me?. Like his first book, this one is charmingly illustrated by Annie Wilkinson. Amy: Hey, Marc! Congratulations on the publication of What About Me? Tell us a bit about it. Marc: Hey there, Amy! Thank you, and thanks for inviting me to stop by to have this conversation with you. In the story, the nameless main character is vying for the attention of her two older sisters, who seem oblivious to her appeal for recognition. They aren’t being mean; they are just in their own little worlds. As the story progresses, our lead character must come to understand that with a little creativity and imagination, she can learn to be her own best friend. She learns that she doesn’t need to seek validation outside of herself, and that it is ultimately up to her to make herself happy. This story is an attempt to explore the theme of self-empowerment, which is truly a universal theme that folks of all ages can embrace. Amy: Will you share your inspiration for your books? Marc: Many of the stories I’ve written are based on the interactions, antics, and shenanigans I witness my three elementary age daughters engaging in during their everyday lives. I notice their interesting or quirky behaviors such as my middle daughter Delaney’s old habit of needing to carry many of her possessions around the house and whenever we’d leave. This particularly priceless practice of hers sparked the idea for my first book, The Girl Who Carried Too Much Stuff. What About Me? is based on my youngest daughter, Journey, and her perceived interactions with her two older sisters. Perceived in that even though the stories are based on them, the stories are told through the lens of my perspective. All three of my girls get along splendidly, however there are those occasions when I notice that the older two are off engaging in some little household adventure, while Journey is off somewhere doing something solo. Most of the time Journey seems content, but there are those times when I feel like she’s been purposely left behind because she’s just not old enough yet to keep up. After witnessing several of these instances, I began to wonder how she might feel about being treated like a third wheel. Maybe she doesn’t mind it at all, but I thought that this episode in their lives would make a great story. So I sat down and wrote What About Me? Amy: How was the experience publishing your second picture book? Marc: I am excited to have recently published my second book. I experienced a much easier time around publishing the new book than my first book, The Girl Who Carried Too Much Stuff. The first book was almost four years in the making. I wrote the story but I wasn’t sure what I was going to do with it, because I didn’t know much about the publishing world in general. Once I performed a bit of research, I decided that I wished to self-publish the book as opposed to seeking traditional publishing. I set out down the road to self-publish, but I had almost no idea what I was doing at first. I learned through trial and error with the help of some very supportive artists and professionals. 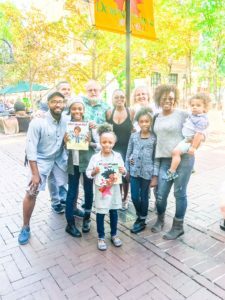 This time around I didn’t feel like a rookie; I didn’t have to wonder about whether to self-publish as I had my personal publishing apparatus in place already, so to speak. So this time it felt like a rather painless process. Amy: Why did you decide to self-publish your first book? Marc: Probably because I’m a little crazy. 🙂 Mostly it’s because I’m a bit of a rebel. I’ve never fit completely in with many social standards. 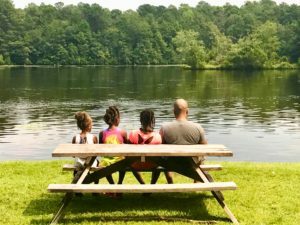 For example, I was one of the first stay-at-home dads that I’d ever known 11 years ago, and now we are more common place. I chose to go into self-publishing because first of all, I didn’t want to wait to be picked. I chose to pick myself! I feel like I have something to say through the stories I tell, and I didn’t want to have to wait to tell them. 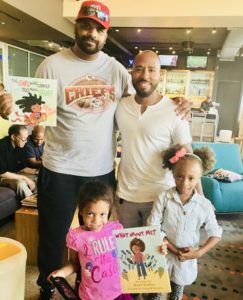 When I was ready to follow my goal of becoming a children’s book writer, I knew it; and I didn’t want to wait any longer. I was ready to just go for it with a sort of against-all-odds attitude. I worked through my initial fear and attempted to just focus on putting out my best work, allowing the chips to fall where they may. Today’s publishing world is so different than in the past that it afforded me the opportunity to do this. Not to mention, my first book was like my baby and I didn’t want to give her away to the traditional publishing world to raise. That’s the stay-at-home dad coming out in me. Amy: Do you see yourself continuing to self-publish or do you see pursuing traditional publishing at some point? Marc: This is a question I’ve wrestled with from the very beginning, before I made the informed decision to self-publish. Which way should I go? I certainly have nothing against pursuing traditional publishing. There is something to be said about having a team of professionals to help a relative newcomer like me with the process. Being new to the game, it would be nice to have an agent or publisher hold my hand as I continue to develop and grow in this industry. And I’m certain that the education I would receive from such a partnership would be invaluable. One of the biggest issues I’ve had with self-publishing has been the marketing, promotion, and distribution. So yes, I am truly open to the idea of receiving some assistance to further the career I’m working to firmly establish. Amy: There are so many writers looking to publish picture books. What do you feel sets your writing apart? Marc: There are so many reading choices out there, so what would make someone want to choose one of my stories to read? When a writer is striving to be heard, it’s easy to feel lost in the shuffle. During these times I try to remember that I have something to contribute as well. With my writing, I attempt to entertain, educate, and inspire. These attributes are common in all of my stories. Part of what I hope makes my writing entertaining is my rhyme style. It is definitely what gives my work its flavor. I also don’t shy away from using words that may be above a certain reader’s grade level, and after reading my stories I want you to feel something. I try to write thought-provoking pieces. Amy: What threads all of your stories together? Marc: The need to write stories that contain universal themes that all people can relate to. No matter how old or young you happen to be. And the strong desire to present people of color as the lead characters in my books. Amy: Why is it important to you to send main characters of color out into the world? Marc: Because there is a whole segment of people out there who feel left out, forgotten, invisible. Diverse books help to remind the world there is more than one story to be told, more than one perspective, more than one culture. And, diversity is normal! You don’t only see one race or one gender when we leave our homes. There are many different types of people, with various positions and points of view. Diversity is a beautiful thing; it should be embraced, and reflected in the books we read. Amy: What has surprised you about the writer’s life? Marc: (1) How much better I feel when I’m writing. If I don’t write I don’t feel right. (2) How many other people wish to also write books and articles. I can’t tell you how many people have solicited advice about how to write and how to publish, and have asked if I would critique their work since they found out that I published a couple of books. And I’m thrilled to be of service in that way. Amy: What has been the most rewarding part about the writer’s life? Marc: One of the most rewarding things about the writer’s life is being able to write. To start with a blank page and have a story come together the way you wish is great. To publish a book and have it accepted to the VA Festival of the Book is an amazing feeling. To have an article published in a magazine is very rewarding. To have someone actually ask your advice about writing, because they believe that you may be an authority on the subject, is fantastic. For someone to say that they really love your work is worth all the effort. Amy: What has been the most challenging part about the writer’s life? Marc: Writing can be a lonely pursuit. Often I wonder if anyone cares about the work I put out. The vulnerable feeling of putting yourself out there to potentially be judged by others can be nerve-racking. Am I good enough to even call myself a writer? Sometimes it’s really hard to produce something you feel is worthy enough to present to the world, and after you do, the insecure feelings over the quality of your work are always there. Some writers wish to be JK Rawlings or John Grisham or Walter Mosley, and if you aren’t that it feels as if you have to fight off the stigma of this being “just” a hobby. There are certain expectations you put on yourself as a writer and the perceived expectations of others that seem to be ever-present. The only thing I can do about that is to put out the best content I can, and let the work speak for itself. Because it isn’t about me, it’s about the work. Amy: What other stories are you working on these days? Marc: The beauty of being in a wonderful writing critique group like ImagineInk is that we usually submit new material to one another for review every three weeks. Without my writing crew, I probably wouldn’t write as much as I do. You all have been holding me accountable for the past three years. So I’m always working on something new. 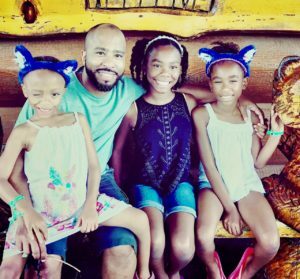 I have a picture book story I’m working on now that touches on childhood poverty, and I just wrapped up an article I wrote for a local magazine that explains how my daughters often provide fodder for my stories. Amy: What other interests do you have besides writing? What else fills your days? Marc: When I’m not writing, I’m usually reading. I’m an avid reader who loves the Easy Rawlins mysteries by Walter Mosley. I’m very much into spiritual books like those from Marianne Williamson and also Eckhart Tolle. I try to stay fit by running a mile a day, and I have a daily meditation practice. 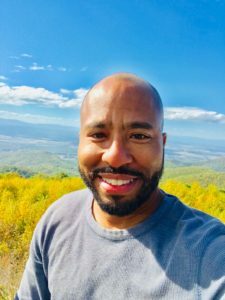 I also enjoy watching old movies, listening to classic hip-hop, taking walks, cooking, and spending time with my family traveling or just being silly with them around the house. Amy: Is there anything else you’d like to tell us? Marc: I just want to thank you, Amy, for giving me this opportunity to chat with you. 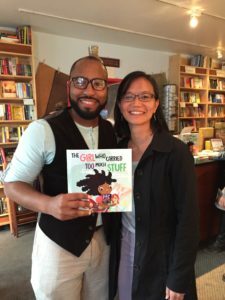 I’d also like to encourage everyone to continue to support diverse books, and to always strive to live as fearlessly and authentically as possible. Peace & Blessings. Amy: Thanks so much for stopping by, Marc. It’s been fun to learn more about what makes you tick. I look forward to your next writing group submission. See you soon! And thank YOU for stopping by. Marc’s books are available at http://www.marcboston.com/. If you’re local, Marc and I will both be at the Charlottesville Book Fair on Saturday, November 18 from 10 a.m. – 4 p.m. at CitySpace on the Downtown Mall. Please come say hey to over 40 local authors!